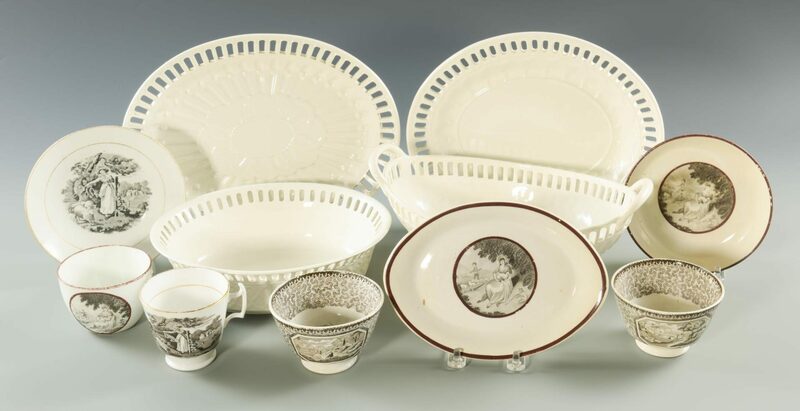 Grouping of creamware and transferware porcelain, including Wedgwood and Hackwood, 11 items total. 1st item: Wedgwood creamware oval platter with reticulated rim. Stamped "Wedgwood" on base. 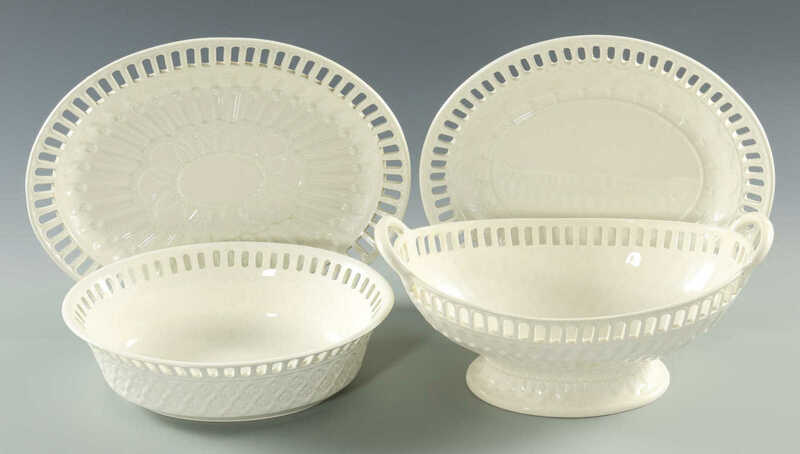 1 1/4" H x 10 1/4" W. 2nd and 3rd items: Creamware oval server and oval platter with reticulated rim. Stamped "Hackwood" on base. 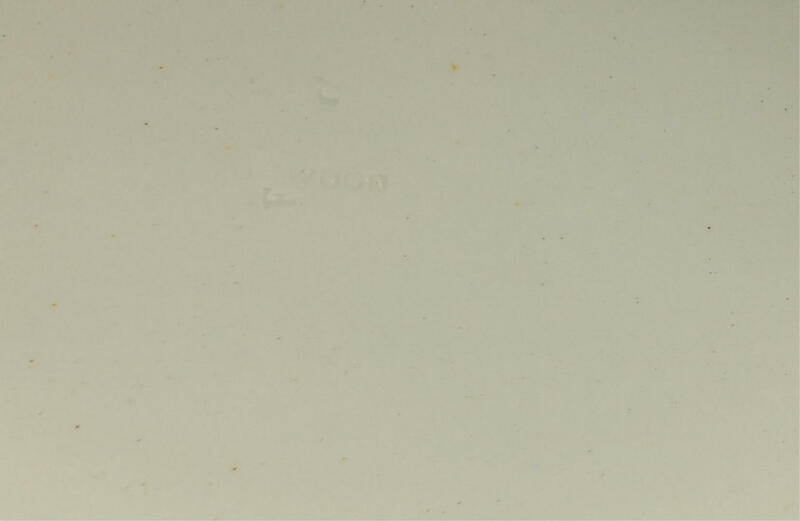 Server – 5" H x 10 1/2" W. Platter – 1" H x 11" W. 4th item: Creamware oval server with reticulated rim. Stamped "Wood" on base. 2 3/4" H x 9" W. 5th and 6th item: Pair of brown and white transferware cups or bowls featuring pastoral scenes. 2 3/8" H x 3 3/4" W. 7th and 8th items: Black and white transferware cup and saucer with pastoral scenes and gold trim. Label on bottom. Cup – 2 3/4" H x 3 5/8" W. Saucer – 1 1/4" H x 6" W. 9th-11th items: Black and white transferware cup, saucer, and oval dish with pastoral scenes and deep red trim. Cup – 2/14" H x 4" W. Saucer – 1 1/4" H x 5 1/2" W. Dish – 5/8" H x 7 5/8" W. All Late 19th/Early 20th century. Provenance: Estate of James J. Allen, Knoxville, TN. CONDITION: 1st-4th items: Overall excellent condition. 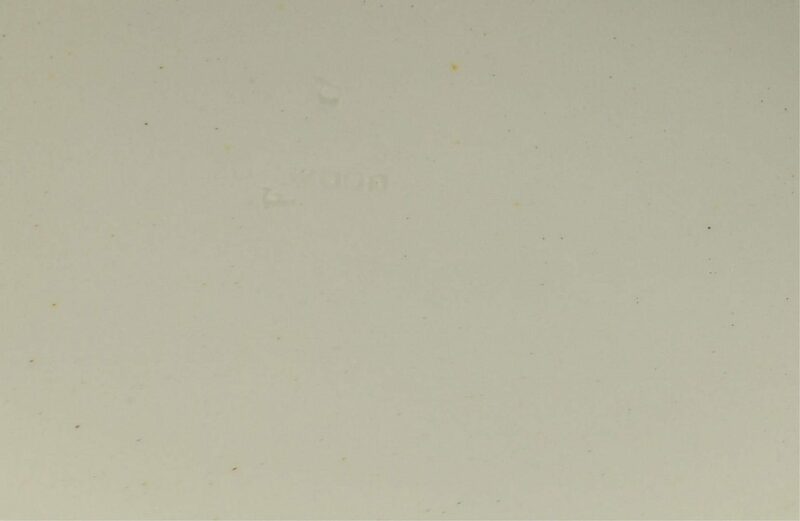 5th and 6th items: 1/2" chip to rim of one cup, interior scratches, marks of both cups, sticky residue on bottom of one cup. 7th and 8th items: Gold trim faded. 9th, 10th, and 11th items: Deep red trim faded, transfers faded.